Someday I’ll take the plunge into electronic social media. Until then, the best way to reach me is by University Email at Robert.thorson@uconn.edu. For additional contact information, please chose one of the three options below. 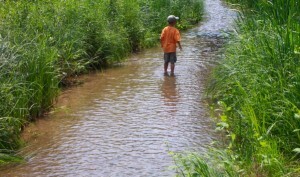 Photo: Little boy wandering down the Mississippi River at it headwaters draining Lake Itasca, Minnesota. He is in direct contact with the most important River in American History.